The Whitefish City Planning Board will take a look this week at a new bicycle and pedestrian master plan for the city. Greater connectivity and safety improvements for the city’s trails and sidewalks is the focus of the bike and pedestrian master plan that if adopted will become an amendment to the city’s growth policy. The planning board will hold a public hearing on the plan at its Thursday, Nov. 17 meeting beginning at 6 p.m. at interim City Hall. The plan known as Connect Whitefish was created by WGM Group. The document is intended to help guide city decision-makers in creating and maintaining bicycle and pedestrian infrastructure over the next 20 years. The plan looks at the current state of bicycle and pedestrian options, uses input from the community to choose priorities and then offers suggestions on how to achieve selected goals. Whitefish’s pedestrian and bicycle network includes about 41 miles of sidewalk, 13 miles of shared use paths and two miles of bike lanes on city streets. The plan outlines $23.5 million worth of trail development in Whitefish over the next 20 years. The plan makes 11 policy recommendations and divides trail projects into three tiers of priority — immediate consideration in the next five years; intermediate for 5-10 years; and long-range for 10-20 years. The top priority is the completion of the Whitefish River Trail as a 10-foot-wide shared-use path with lighting and wayfinding signage from the Skye Park footbridge to JP Road. It also seeks to prioritize connections between the river trail and existing routes that provide safe access to downtown, schools and parks. Roughly $5.6 million for trail development is included in the first tier. The highest ticket item is the estimated $2.3 million trail from Lion Mountain Road to Twin Bridges Road, which is expected to be completed by the Montana Department of Transportation. The connectivity category includes 57 recommended projects. The top seven projects on the list involve improvements to the Whitefish River Trail. 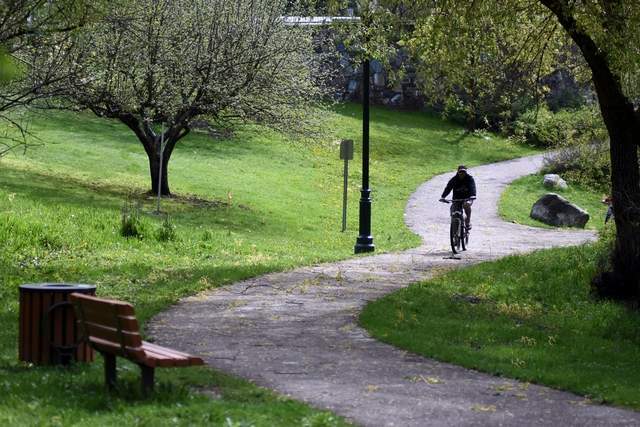 The top project is listed as extending the shared use path along the river between Second Street and Railway Street, connecting the trail from Kay Beller Park to the BNSF loop, at an estimated cost of $113,000. There are 28 recommended projects under the safety category. Some safety concerns come from a lack of standardized design guidelines, the plan states, such as narrow bike lanes, unsafe path crossings and dysfunctional bike racks. The plan recommends adopting guidelines to improve safety, along with developing a plan for uncontrolled intersections. On maintenance, the plan recommends the city budget a minimum of $2,000 per mile for short-term operations and maintenance of asphalt paths and develop a long-term maintenance schedule for asphalt paths and provide annual funding of about $3,700 per mile to meet the minimum requirements for preservation of existing facilities. The plan notes that cost estimates are for planning purposes only. Funding for bicycle and pedestrian projects will become increasingly more difficult in the future. The plan notes that federal earmarks for paths is unlikely, state Community Transportation Enhancement Program grants no longer exist, and sunset of the city’s tax increment finance district in 2020 will make funding a challenge. It suggests creating a new TIF district for urban renewal based on the benefits of a connected river trail. It also suggests creating public/private partnerships to help fund large projects. The city adopted its current bicycle and pedestrian master plan in 1998 and adopted amendments to the plan in 2003 and 2007. The city Parks Board recommended the plan with some minor changes. Also on the planning board agenda is a continued public hearing on a preliminary plat for Cottonwood Estates. The planning board continued the hearing at its October meeting after concerns were raised about proper drainage for the subdivision that appears to have high groundwater. The 22-lot subdivision on 4.7 acres is planned for east of Colorado Avenue and north of Denver Street. The developer has revised its storm water drainage plans for the property. Instead of directing storm water into a swale along the back of private lots as previously planned, the concept now shows curb and gutter in the subdivision and one lot being used for storm water. Overflow storm water will also be conveyed into the existing storm sewer system in Colorado Avenue. The property is zoned WR-2, which is used for two-family residential homes. Nine of the lots could accommodate duplex or single family homes and the remaining lots are sized for only detached single family homes. Planning staff is recommending approval of the subdivision with 19 conditions. The planning board will also hold a workshop on a draft of a corridor plan and zoning amendment for U.S. Highway 93 South just outside of Whitefish. A group of landowners in the corridor have submitted the plan to Flathead County for potential adoption. The plan covers a 490-acre area from Montana 40 south for about 1.5 miles along a stretch of Highway 93 ending near North Valley Refuse. The plan calls for a special overlay zone with strict development standards that appear to be consistent with Whitefish zoning standards for landscaping, buffers, site plan requirements, architectural design, sign standards, parking, and dark skies lighting. The plan also calls for changing the zoning on most properties in the area and then a zoning overlay would place specific standards on the properties. What is currently zoned AG-20 would become SAG-5, and what is SAG-5 would for the most part become business service district, which is similar to the Whitefish business service district zoning that the county recently adopted to match similar zoning in the city. Dave DeGrandpre, a land use planner with Land Solutions, LLC of Charlo, is representing property owners in the corridor. He submitted the plan to the city Planning Board last month asking for their comments on the document before it goes to the county Planning Board on Jan. 11. “It has many elements that are attractive zoning protections to address aesthetic and safety concerns within the overlay standards of the corridor,” he writes in his staff report. However, he says the scope and stretch of the commercial zoning types is concerning, especially the creep of the secondary business district south of Montana 40 and the width and length of the proposed business service district, which should be narrowed to properties adjacent to the highway and not extend much past Blanchard Lake Road.